Yesterday was the 1st of August…and it really made me realize how fast time flies by! I moved here on the 4th of February and sometimes it seems like I’ve been living here forever…sometimes it seems I just saw my parents yesterday. 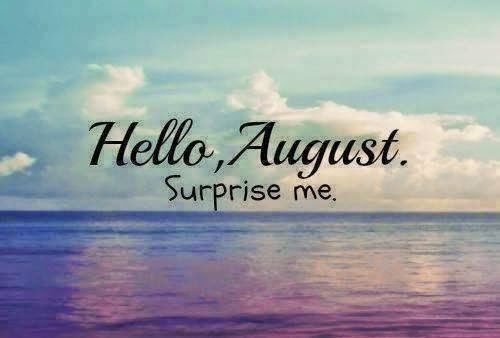 I wish everyone an amazing August! Make the best of it everyday, the best YOU can! Be happy, don’t over think things, see the positive in everyday, don’t let other ruin your mood, because it’s up to you to make the best of every single day in your life! If you can’t change it or control it, stop focusing on it! Things will end up getting into place when you least expect it, I promise you! And when they do, you’ll appreciate them even more! It’s the last month of Summer (not that we’ve had much of a Summer here in Austria! ), so take in those late sunny afternoons, those dates with your friends, the free time you have, as small as it might be, take it in, be happy and enjoy this month! Have an amazing August everyone! The day I challenged myself! Previous Post Open letter to the girl who hate messaged me on Facebook!